Ah, Barcelona. A city complete with ancient Roman ruins, epic nightlife, Gaudi’s most famous architecture, stretches of glorious beaches- the list goes on. How does one place that barely rises before noon manage to cram so many wonderfully different things into the country’s second largest city? And how on earth does one traveler see it all without losing sight of the equally important/infamous relaxed Catalonian lifestyle? Grab a sangria, we’re here to help. 1. La Sangrada Familia. Surely Gaudi’s most famous creation, this massive cathedral began construction in 1882 and is still incomplete. Regardless, it draws enormous crowds and lines are long, so visitors are advised to book ahead online for entry into the nave. 2. La Rambla. A tourist spot if there ever was one, but historic buildings, street performers and busy (but expensive) cafes perfect for people watching make this tree lined boulevard a pleasant place for a sunny stroll. Don’t forget to look down- the pavement is designed to resemble rippling water with a large, colorful mosaic to boot. 3. Parc de la Cuitadella. The city’s largest green space, this park is home to a zoo, a lake for canoeing, scenic pathways, a very large fake elephant (only the important stuff here, guys) and the breathtaking Font de la Cascada. Gaudi, still an unknown architecture student at the time, was the assistant in its construction for the universal exposition in 1888. It is remarkable none the less. 5. Plaça Reial. A popular square full of cafes, restaurants and hidden bars, this beautiful palm tree lined space has street lamps designed by Gaudi. 6. Museu Picasso. Home to one of the most complete collections of Picasso’s art, this museum is free for college students and each Sunday from 3pm. 7. Temple d’August. Once a Roman temple built to honor Emperor Augustus, the remaining columns were discovered in an apartment building in the 19th century and are on display in that same buildings courtyard today. 8. Parc Güell. A bit outside the city center, this UNESCO World Heritage Site is now a garden that looks a little like something torn from the pages of Alice in Wonderland, with magnificent architecture (Gaudi), colorful mosaics (Gaudi again) and sweeping views of Barcelona from the hill top terrace. Some areas are free to the public but seeing the famous El Drac will cost you. 9. Beaches. 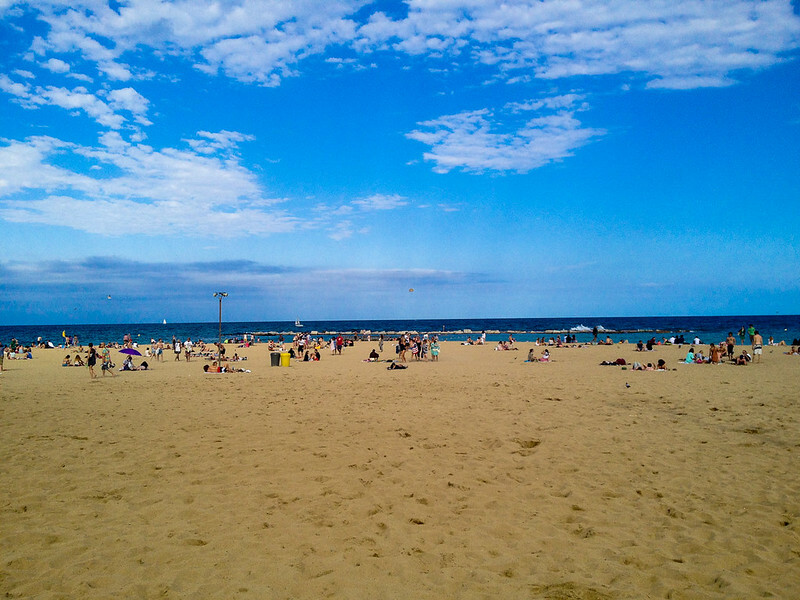 With a solid mix of tourists and locals, both Barceloneta and Sant Sebastià beach are close to the city center and boast lively atmospheres courtesy of the many restaurants and sea side bars nearby. If it’s peace you’re looking for, head past Port Olympic to Mar Bella. Honestly though, you’re at a beach in Barcelona- you really cannot go wrong here. 10. Montjuïc Hill. Ride an aerial cable car to the top of this former Olympic host. Once there, experience the Palau Nacional, Font Màgica, an 18th century fortress and excellent views of Barcelona harbor. 11. Casa Batlló. In the early 20th century, the Batlló family commissioned Gaudi (yes, this is a Gaudi heavy city) to design this open-to-interpretation (some say dragon, some say ocean, who are we to decide?) home that tourists can visit for a pretty penny. It’s worth a look even if you don’t go inside and bonus points for visiting La Pedrera down the street. 12. Santa Maria del Mar. Barcelona’s first Catalan Gothic church, built by the people for the people and known for it’s amazing architectural symmetry. 13. 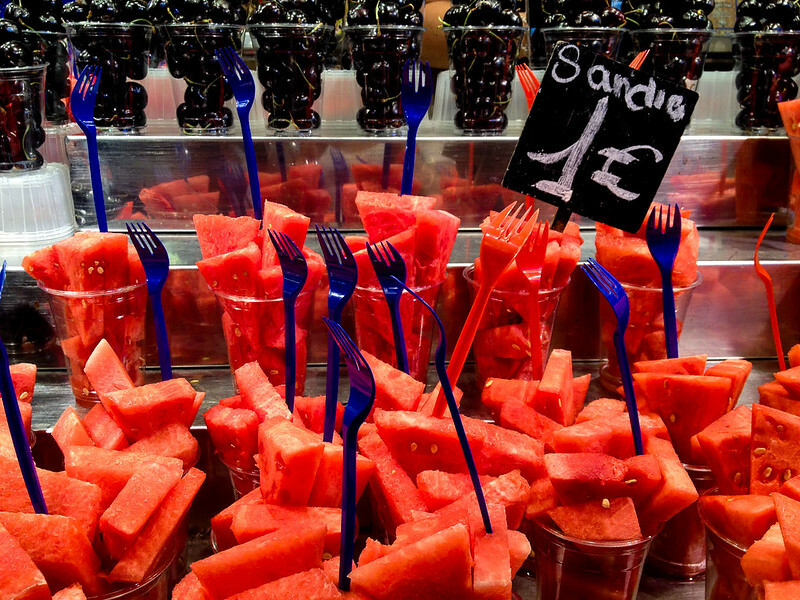 La Boqueria. Off La Rambla, this large covered food market dates back to 1826 and sells everything from fresh tomato juice to tapas for as little as 1 euro.